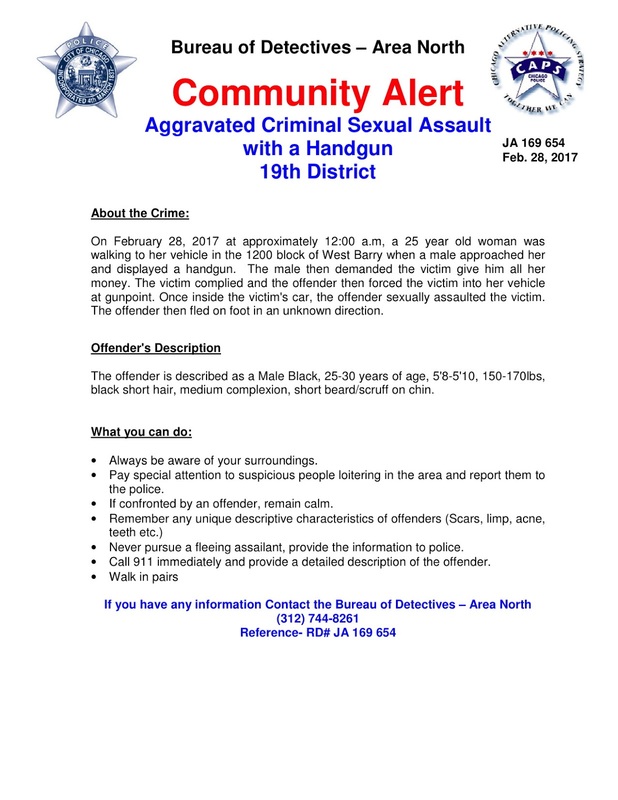 A 25-year-old woman was robbed at gunpoint and raped in her car near Barry and Racine this morning, Chicago police said. The woman was walking to her car in the 1200 block of West Barry around midnight when a male offender approached her and pulled out a handgun. He demanded the woman’s money and then forced her into her vehicle at gunpoint. Once inside the car, he sexually assaulted the victim, police said. He then fled in an unknown direction. Police describe the offender as a black man between 25- and 30-years-old. He stands about 5’9” tall and weighs about 160 pounds. He has short hair, a medium complexion and he has a short beard or scruff on his chin. Anyone with information about this morning’s attack is asked to call Area North detectives at 312.744.8261 about case #JA169654.